Tim Kopra of NASA, Tim Peake of ESA (European Space Agency), and Yuri Malenchenko of Roscosmos joined their Expedition 46 crewmates aboard the orbiting laboratory when the hatches between the Soyuz TMA-19M spacecraft and the International Space Station officially opened at 2:58 p.m. EST. Expedition 46 Commander Scott Kelly of NASA and Flight Engineers Mikhail Kornienko and Sergey Volkov of Roscosmos welcomed the trio aboard their orbiting home. The incoming trio will spend about six-months aboard the station. Kelly and Kornienko are about nine months into their one-year mission, and are scheduled to return home in March 2016. These trips also enable the Roscomos to rotate a crew member and a Soyuz spacecraft. Each Soyuz remains in orbit about six months. Follow the space station blog for crew activities at: https://blogs.nasa.gov/spacestation. To join the online conversation about the International Space Station, follow @Space_Station, and check out all the ways to connect with NASA at: https://www.nasa.gov/socialmedia. So pleased Tim and the crew arrived safely – have a great time watching down on us!! 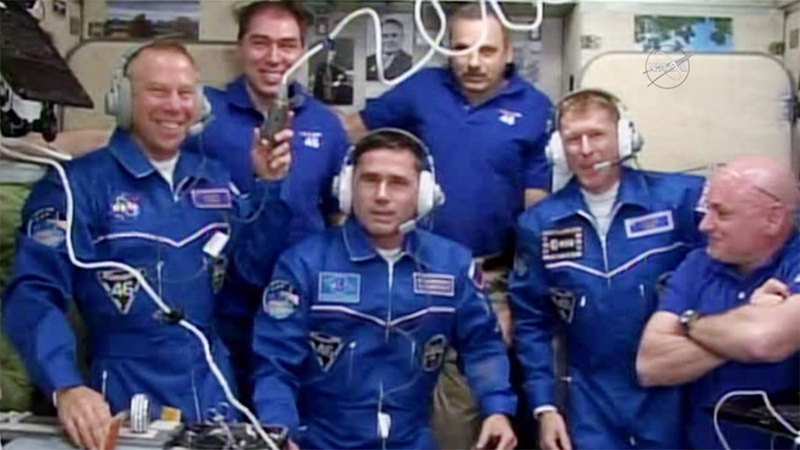 Congratulations Expedition 46 to have six more new crew on the Space Station. Congratulations for launch and rendevous success. We are thankful for the nice impression. This is from Japan with new smile twice over. I am so happy they got there and many congratulations so the launch. I would love to know if you recognise the countries looking down from space and how far can you see country to country? The crew has a computer map that shows where the space station is orbiting over Earth. This gives them the opportunity to photograph natural and man-made geographical features. Thank you for responding to my question. I am assuming that they need to rely on the computer because of the speed they are travelling. It’s amazing that the camera can focus on features when they are travelling so fast. The view from space must be spectacular! Thank you guys for bring hopes to mankind. Hope you guys have a lovely , safe and stress free Christmas. We wish you all success in your mission and a safe journey home. Stay safe, and may God bless your and all of the crew members up there!. Happy New Year!